Innov+ launches Toucango, an active security system aimed to road professionals. Road risks remain the first cause of fatal accidents for employees. Every year, about 11 % of road deaths are employees who drive for work. 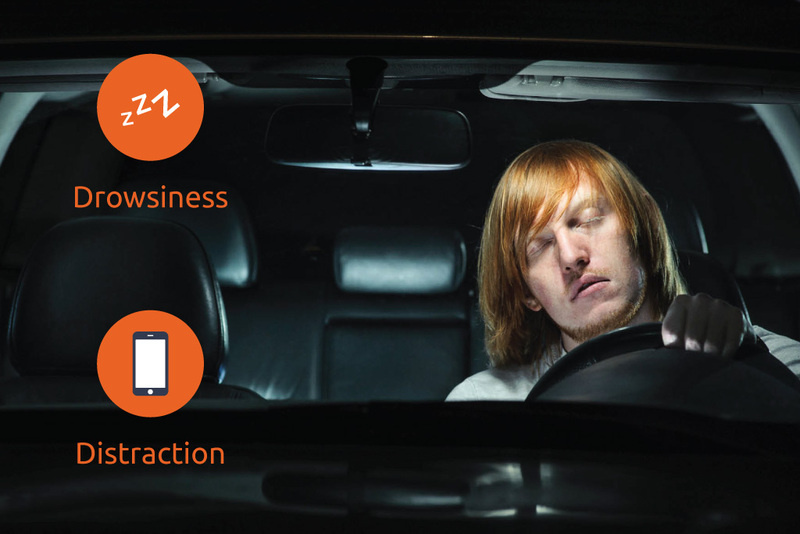 1/3 of fatal accidents is due to drowsiness at the wheel and 1 accident out of 10 is due to the use of a smartphone at the wheel. In designing Toucango, we have in mind to secure roads of France and Europe starting from the statement that hypovigilance, drowsiness and distraction are the main causes of accidents behind alcohol and speed at the wheel. Toucango, a predictive vigilance assistance device for professionals. Innov+ is willing to assist the driver and to help him remaining vigilant at the wheel. Toucango is an active security system which alerts the driver at the first signs of drowsiness and distraction in order to reduce the risks of accidents due to hypovigilance. It is the strength of our technology to be able to see when the driver is getting drowsy and to alert him of drowsiness premises. Toucango, an ADAS focused on the driver. The ADAS are systems developed to help the driver and particularly to increase safety as well as to enhance the attention of the driver. 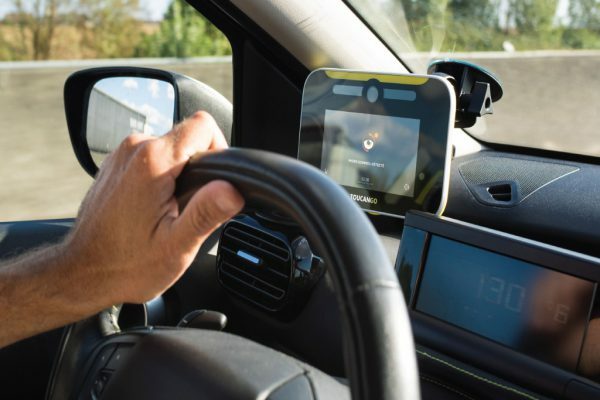 The detection systems for fatigue, distraction and vigilance of the driver that are nowadays embedded on vehicles are mainly based on the vehicle’s behaviour itself, that is to say on lateral deviations, brutal decelerations, abrupt steering, travel time, time slot… What about the driver ? Toucango focuses on the driver’s behaviour and differs from the other ADAS because of its cognitive and physiological analysis of the driver’s face. This enables the detection in real time of the drop of vigilance and focus on the road. The solution Toucango, what it is all about? the device Toucango Pro is ergonomic and removable. It is mounted on the vehicle dashboard and assists the driver with alerts as soon as the first signs of drop of vigilance occur. the web service Toucango Fleet is dedicated to the fleets management. It aims at working for the risks prevention dealing with drowsiness and distraction at the wheel. How does the device Toucango Pro alert the driver? The current systems embedded on vehicles usually display a symbol with a cup of coffee, remaining the only tip for having a break, completed by a sound signal. Toucango goes further. 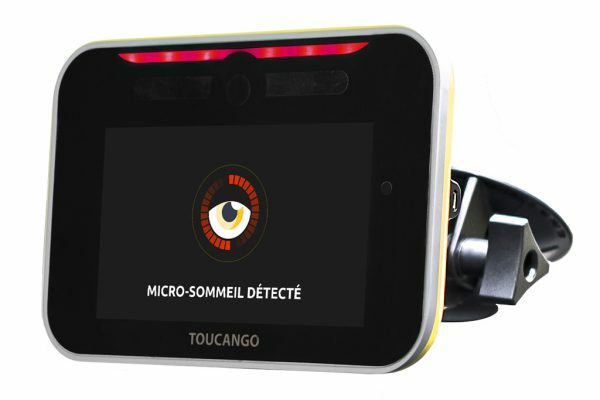 The device Toucango is smart ; it recognises the previous steps of hypovigilance so that it can suggest relevant alerts to the driver during its travel. At the end of the drive, a coaching will be proposed to the driver who will get a scoring with the comparison to his previous travels and to the average of other users and volunteers of the Toucango community. 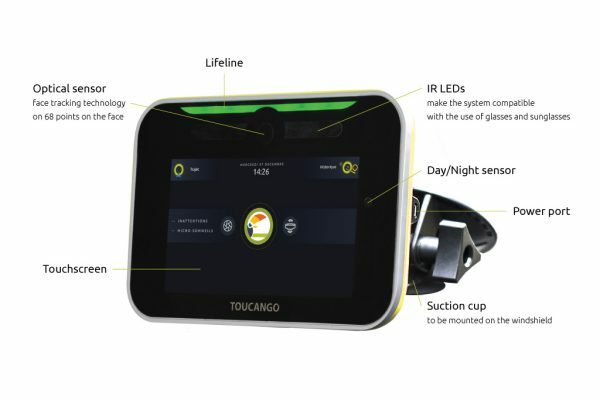 When Toucango detects a moment of hypovigilance or distraction at the wheel, the driver is immediately alerted by a sound alert, a visual alert on the screen and a vibration on the wristband which can be useful for coach drivers in particular. The « lifeline », located at the top of the device, evolves and changes its colour regarding the level of hypovigilance of the driver, from green when everything is fine to red meaning an imminent danger. A relevant message is displayed on the screen and suggests the driver to remain vigilant. A beep is emitted to characterize the alert. According to the relevance of the danger, a pre-recorded voice can also give advices and recommendations. Connected in Bluetooth, the wristband vibrates to inform of a hypovigilance event. It is very useful in discreet mode for the coach drivers in particular during their travels at night. How does Toucango Pro work? the opto-electronic card with its NIR optical sensor, its electronics and its IR LEDs enabling the analysis and the face tracking of the driver both day and night as well as the tracking of the eyes gaze, even behind sun glasses. the innovative face tracking software that analyses the driver’s emotions. It has been built to analyse the hypovigilance events of the driver at the wheel, coupled to the sensors of the calculator card. the electronic calculator card and its environmental sensors, GPS, accelerometers and gyrometers. The device is driven by a touchscreen. It is also connected to the GSM network and allows the geolocalisation of the vehicles as well as of the alerts sent to the driver. The device is mounted in 2 clicks thanks to suction cup on the windscreen or with a screw on the dashboard. It is powered by the vehicle cigarette lighter socket. Once it is well oriented towards the face, the driver is no more alone at the wheel: he travels with his safety mate Toucango during his travel. The driver is therefore assisted by two main functions: the vigilance assistance and the navigation assistance. The device sends sound and visual alerts as soon as the first signs of drowsiness and distraction occur. The optical sensor Toucango and the innovative face tracking algorithm make this device the most predictive one so far, based on the driver’s change of behaviour. The device Toucango is suitable for all kinds of vehicles and drivers, and provides a great flexibility to the companies. Toucango is a real active safety system, collaborative and modern which makes great savings for the companies and the equipped drivers. 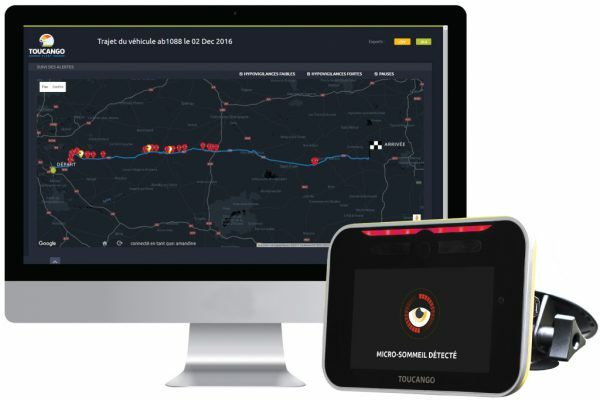 Thanks to the connected device ToucangoPro, Innov+ generates new data coming from the community of connected vigilant drivers, such as Waze, TomTom or Coyote. 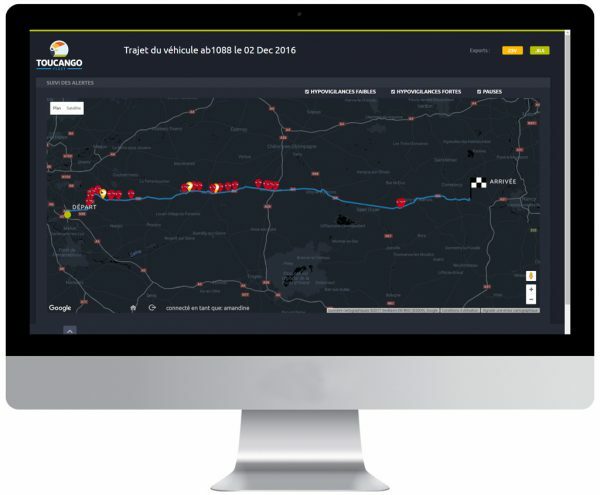 Therefore, Innov+ has built a service around a web interface ToucangoFleet aimed to transport companies and road safety actors in order to measure the present risks for their drivers. This will help the companies to set up prevention actions for securing their transport activities. Innov+ has built a Big Data architecture and new Machine Learning algorithms. Each driven kilometer makes the devices Toucango more accurate and predictive, for a greater satisfaction of the client. These new Machine Learning algorithms will make easier the integration contracts of our technology in OEM towards the vehicle of the future. Wish to know more about Toucango? Innov+ is a French start-up that designs innovative face-tracking technologies at man's service. The company has launched the brand Toucango, a smart driver's vigilance assistance solution. It is aimed at reducing the number of accidents due to drowsiness and distraction at the wheel. InnovPlus © 2017 All rights reserved.